Extra Judicial Killing: 2 more in "Gunfight"; total 6 persons were killed in last 3 days! 2 more in "Gunfight"; total 6 persons were killed in last 3 days! By Bangladesh Media; Two alleged robbers were killed during separate gunfights with Police in the district of Moulvibazar and Jessore early Sunday. Including this two the total of 6 people were killed in last 3 days. Which means 1 people were killed in every 12 hours. Spot Jessore: In Jessore, a supposed ‘robber’ was killed in another ‘gunfight’ with police at Mirjanagar village under Keshabpur upazila. The deceased was identified as Rajab Ali, 42. Abdul Jalil, officer-in-charge of Keshabpur police station said responding to a tip-off, a team of police conducted a drive at Bakra police camp under Jhikargachha upazila at 10:45pm. At prima facie, Rajab confessed that he has arms. Later, the police carried out another drive along with the arrested robber in the Mirjanagar village to recover his illegal firearms after midnight, Jalil said. 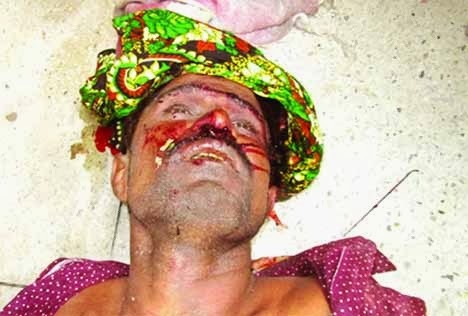 As the police reached the area, some other associates of Rajab opened fire on them. The police also returned fire, triggering a gunfight with the miscreants at around 1:45am, the OC added.Rajab succumbed to his injure while taking to Keshabpur upazila hospital, police said.At least three police personnel were injured in the incident, the OC claimed and said the injured were rushed to the upazila hospital.Police recovered a shutter gun, two rounds of bullets and a machete from their processions.At least 23 cases, including robbery, extortion, arms and murder charges had been pending against Rajab, police claimed. The body was taken to Moulvibazar Sadar Hospital for post mortem examination. At least 10 burglary cases had been pending against Babul, police further said. Spot Moulvibazar: In Moulvibazar, officer in charge of Kulaura police station Md Hasanuzzaman said they raided Koyerchar area in Bhatera rubber garden under Kulaura upazila while a group of robbers were taking preparation to carry out a burglary in the staff quarters of the garden. The deceased was identified as Babul Mia, 3o. Sensing the presence of the law enforcers, the robbers opened fire on the police prompting the cops to retaliate, which triggered a gunfight leaving Babul dead on the spot, Hasanuzzaman said. Police said constables Habibur Rahman and Fazlur Rahman also received bullet injuries and were taken to Kulaura Health Complex.